I have many precious memories of my World Cup jaunt. The euphoria of Stuttgart and Kaiserslautern (against Japan, that is), the exuberant generosity of the German hosts, and the chance to meet some of the world's foremost English-language football journalists - I'm not just a football tragic, you see, I'm a football writer tragic. But one of my fondest memories is of a certain game I attended in my "base" city, Frankfurt. In particular, it was a group of fans, rapidly gaining a reputation for jubilant and boisterous celebrations, who put on an unforgettable performance. I refer to the South Koreans. Perhaps encouraged by the fact that their opponents on the day, Togo, were rather short of support, the Koreans sang their lungs out at the vertiginous stadium, accompanying each attack with deafening roars of encouragement. 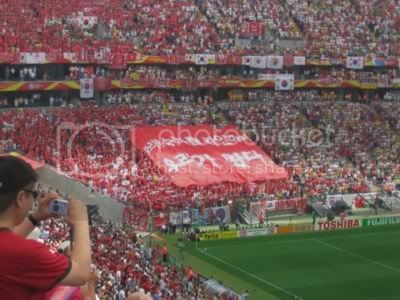 Some high-pitched voices could be distinguished inamongst the roars, too: the Koreans, like the Japanese, have a distinctly co-ed approach to football fandom. Even before the match, there were signs that this would be an afternoon to cherish, from a fan-spotting perspective. A continuous stream of red T-shirts stretched from the Main river to the stadium, each, it seemed, sporting a different slogan or image. Not for the Koreans the name-on-the-back productions favoured by their Japanese rivals; most of the catch-phrases printed on the Korean attire constituted an appeal to collective effort and struggle. In an amusing sidelight, the media representatives who emerged from the shuttle-bus bathed in sweat were faced by a wall of red at the media entrance; this assemblage of smiling Korean fans had clearly not been informed that this entrance was not intended for them. Not that the German volunteers seemed to mind, and it was hard to stay angry as the red brigade courteously made way for the flustered journos bullocking their way towards the turnstiles. The opening half of the game was pretty joyless for Korea. Struggling to find openings in attack, their defence was regularly made to look ordinary by the excellent Mohamed Kader Cougbadja, Togo's most effective and dangerous player. On the half-hour, Kader scored a richly-merited goal, and the Korean players looked a dispirited lot. There was no let-up from the fans, however; you would have thought it was Korea who had scored, such was the din emanating from the south-west corner of the stadium, where the Korean throng was thickly massed. The game turned on a single incident early in the second half. Togo's captain, Abalo, fouled Park Ji-Sung on the edge of the Korean box, and was given his second yellow card. Togo down to ten. And then there was the free kick; the baby-faced Lee Chun-Soo, perhaps the most popular of the Korean players, sent an absolute corker past Kossi Agassa in goal. 1-1. The Korean chants, accompanied by their insistent drumming, quickly became deafening. And the team responded, finding more space (and width) for their attacking moves. On 72 minutes, Ahn Jung-Hwan - hero against Italy four years ago, and a half-time substitute in this match - scored the winner with a fine shot from the edge of the box. The football in the second half was thrilling, but the display after the final whistle was better still. "Go, Korea!" sang thousands of voices in near-perfect unison, while the Korean drums resounded magnificently around the arena. Half an hour later, I was back in the shuttle-bus, a good 500 metres from the ground, with a thick layer of glass between me and the Korean battalion inside the stadium. They were still going full bore, and I could still hear them loud and clear. Here's to Korea making it through once again to South Africa 2010. Even if their players aren't on song, their fans will provide a more than worthwhile spectacle.